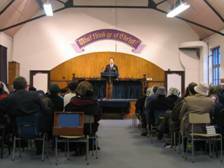 The Catford Lectures - which have been running for well over 50 years now (see "50 Years of Faithful Witness" statement) - offe r Bible teaching on a whole range of topics, covering prophecy, church truth, Christian living, etc. Above all, they want to provide Christ centred and Biblical teaching for the edification of all those who are able to attend, all are welcome. The Catford Lectures are held six times a year, typically on the first Saturday of the month, from November to April. There is a lecture at 4 pm, followed by tea and refreshments at 5 pm, and a lecture at 6 pm. If you are interested in obtaining a CD with recent messages delivered at the Catford Lectures please contact us. Why not come along and find out? 50 YEARS OF FAITHFUL WITNESS to God have passed: This year will, DV, celebrate the 50th year of the Catford Lectures, the first of which in the new series will take place on Saturday 5th November 2005 and continue on the first each winter month until April 2006. These meetings were inaugurated primarily by Mr. John Weston, jr. whose father, also John Weston was a well-known evangelist during the pre- and post-war years. 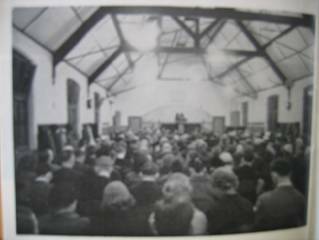 Both father and son were members of the assembly of Christians who met at Wildfell Hall in Catford, South East London and in the early 1950s both had become increasingly concerned that the attendance at monthly meetings held in Wildfell Hall for the exposition of the Word of God was declining. Realising the great importance that Christians should be taught the truths of the Scriptures – for that was surely the food of the soul – the church decided that the Saturday meetings should take on a new form. Henceforth they would be held every first Saturday in the month and consist simply of two meetings, one in the afternoon and the other in the evening at each of which a servant of the Lord endowed with the gift of teaching would be invited to minister the Word. Tea would be served during the interval between the meetings. Publicity was given to this change and the response was immediate: the hall soon being filled with interested hearers coming from all the counties surrounding London and many from even farther afield. This policy is still faithfully pursued and all who attend can be assured that what they hear will be firmly based on Holy Writ. God has sustained this testimony and we pause to testify to His grace and goodness. The brethren responsible for the Lectures look forward to meeting old friends and making new ones in the forthcoming series. A well-stocked bookstall of select literature is provided at the Catford Lectures by Hold Fast Bible and Tract Deopt, 41 York Road, Tunbridge Wells, Kent.